G’day to all who have come across this site of mine. Apologies as it is very much in the background of my life over the past year or so. I hope to get back to this site in future. are quicker ways of getting in contact with me. This entry was posted in Stuff on June 14, 2018 by Mark. 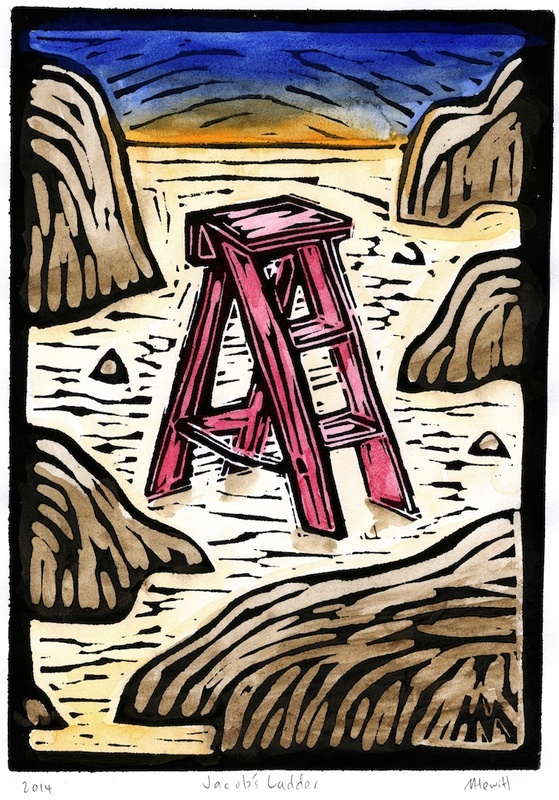 Jacobs Ladder, Genesis 28:10-19, Linocut A5, Handcoloured. Mark Hewitt July 2014. Jacobs Ladder is my imagining of Jacob’s dream. The ladder being the visualisation of God’s blessing. This blessing takes place amoungst rocks. Amoungst normal life. Life is rarely without rocky patches. The ladder reaches to heaven. Heaven though is not out of sight but can be found around us. To see heaven, to see God’s blessing, we need only take one step and the perspective of the situation changes. We might then get a glimpse of a blessing. Heaven, seen here on earth, not beyond our reach, is reflected in colour gently washing over the landscape from the sun that has set. There is also a hint of mystery as we do not know what is out of sight behind the large rocks. This entry was posted in Mixed Media, Pentecost, Year A and tagged Pentecost on July 22, 2014 by Mark. Is the theme for the term of office for the new Moderator of the Uniting Church in Australia, Synod of South Australia, Dr. Deidre Palmer. Dr. Palmer commissioned for her Instalation & commissioning (30 October 2013) an art piece that comprised of 3 circles that spin on an axis. 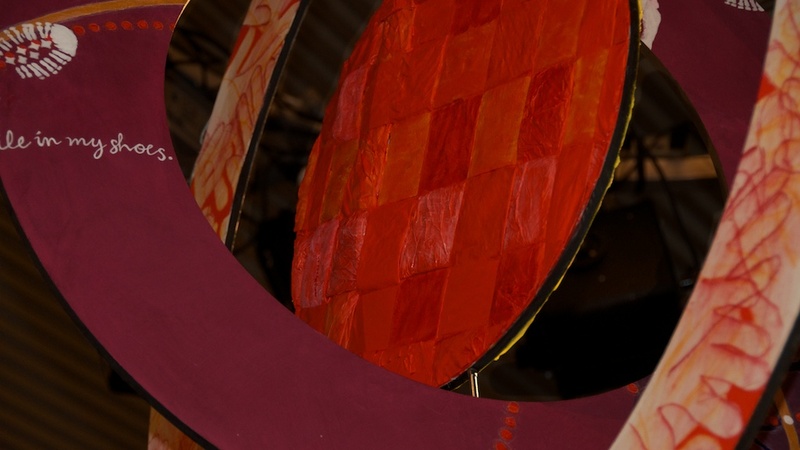 The artists Ella Radke, Susan Wickham, Karan Hudson and myself worked on the surfaces of the circles using the theme; Community in Christ – Living Compassion & Hope. The following is a reflection from each artist published in the Order of Service. Hope is the light in the darkness; a beacon that shines out. It is the flame that leads us forward, keeps us warm and beckons us into the future. We are woven together in the spirit to form a community in Christ. A subtle cross is formed in the pattern of the weave, the stronger the community; all bound together in divine love. Compassion: If we could walk a mile in another’s shoes, with open hearts and minds, perhaps we could learn to understand. With understanding, comes empathy… compassion. Surely this is the way Christ walks in all our lives. Compassion moves us. It takes us from darkest places into new light, into the rough places and out again. When we open ourselves to the Spirit’s work of compassion, we have the capacity to move from being closed to open. Mark Hewitt (outer ring, both sides)Community is all about people and the layers of relationshps that take place within community. Relationships that are vital & vibrant represented by the layers of hands & colour. Hands & colour that blend together, are bound together, as the Spirit binds us together. One of the great images of Hope that bookends the bible, as it is found in Genesis & Revelation, is the Tree of Life. An image of HOPE in that it’s leaves bring healing to the nations. these leaves are represented on one side of the outer ring. Ella Radke, Susan Wickham, Mark Hewitt, Mixed Media 2013. 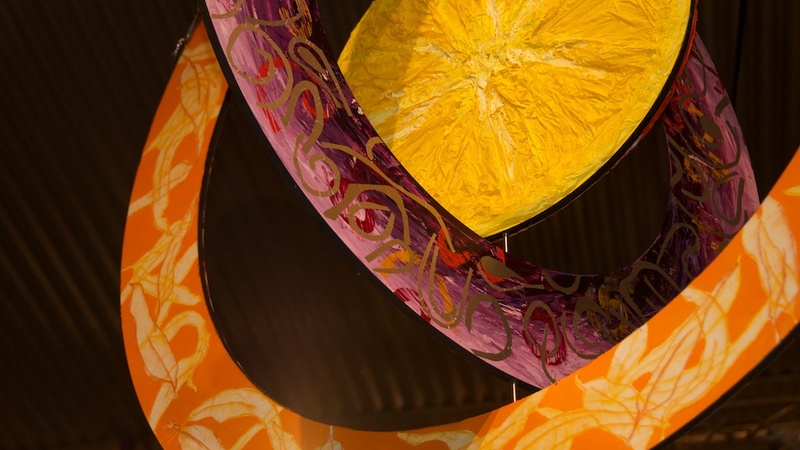 This entry was posted in Installations, Mixed Media, Visual Art on December 1, 2013 by Mark. foreboding clouds from Mark Hewitt on Vimeo. Dark foreboding clouds that set a background mood as we lead up to the Passion. This is a wide screen clip that you may need to crop. Use it by itself or as a background to text. It is 40 sec long so you will to loop it. Double clip on the clip & follow it to vimeo to download. This entry was posted in Easter, Lent, Year A, Year B, Year C and tagged Easter, Jesus on March 10, 2013 by Mark. A Passion Tree, 1997, 2007, 2013, Mark A Hewitt. Wood, wire, paper, pencil, pastel. 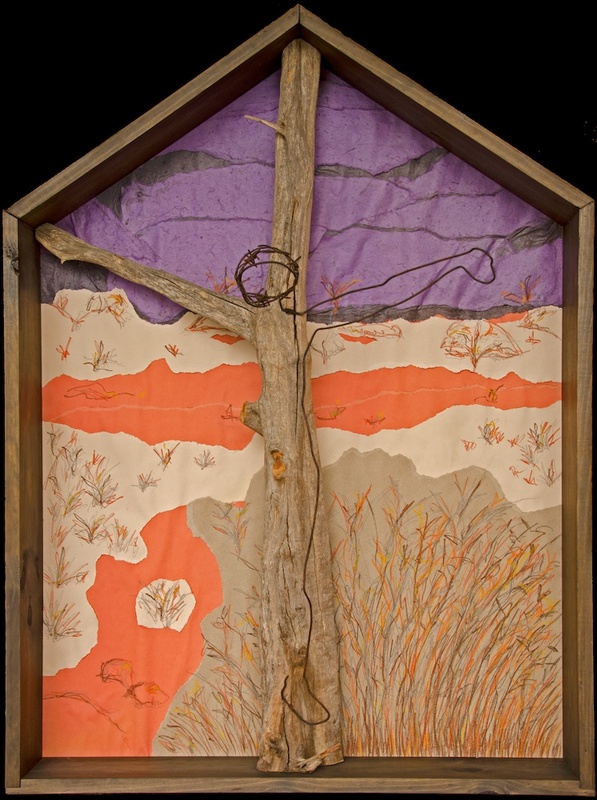 The original intention was to create a piece that explored the crucifixion in an Australian context. A devotional piece. That required close inspection being three dimension. The cross and the tree are one. Physically the cross is a weathered tree root that was from a Eucalyptus tree that had been uprooted in a storm many years before so the root had been well weathered. Jesus body outlined with rusty fencing wire that makes the other part of the cross. Old weathered barbed wire making the crown of thorns. This entry was posted in Easter, Mixed Media, Visual Art, Year C and tagged Easter, Jesus, Passion, prayer on February 27, 2013 by Mark.